A young man with a bullet in his spine lies in a coma. His sister Liliana was whisked away from Portugal’s Azores Islands on a superyacht. If Paulo never awakes, can Aimee and Nick still find Liliana in time to rescue her? 4 Stars: “Although this mystery deals with familiar material, the presentation is fresh and entertaining. Aimee’s best friend Cleo adds a spark to the novel. Some characters are not quite as they seem, which makes for interesting reading. Snappy dialogue draws attention to the rest of the story and pulls it all together. Hopefully there will be another addition to the Aimee Machado line.” Read more…. “Aimee is a delightful narrator, full of heart, and is driven not to simply solve the case, but to find answers and justice. The mystery is real, riveting and challenging as Aimee puts forth every effort not to give up. The action keeps you guessing until the very end. A compelling read for any mystery lover!” Read more…. 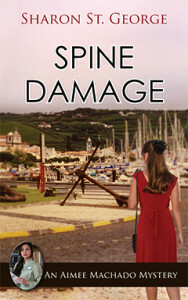 “In Spine Damage, author Sharon St. George once again demonstrates her mastery of the genre with this fourth title in her outstanding Aimee Machado Mystery series. Unreservedly recommended for community library Mystery/Suspense collections.” Read more…. Paulo Ferrara, a young Portuguese man, lies comatose in the Emergency Department of Timbergate Hospital, shot in the spine. The neurosurgeon who would normally be in charge of his care has left town to attend to an injured daughter, and the only other neurosurgeon, the rude and egotistical Dr. Godfrey Carver, is about to be suspended for not completing his continuing education requirements. The unpleasant duty of ensuring that the staff obey the rules lies with Aimee Machado, forensic librarian at Timbergate for over a year. Aimee and her pilot boyfriend Nick live together on her grandparents’ llama farm. While dealing with Dr. Carver, Aimee learns the circumstances of Paulo’s injury and enlists Nick’s help. Aimee is half Asian and half Portuguese, and her parents live on Faial, one of the Azores Islands off the coast of Portugal. Faial is the closest neighbor to Pico, home of Paulo and his family. Paulo came to rural Northern California in search of his fifteen-year-old sister Liliana, who vanished two weeks ago. Nick’s wealthy employer Buck Sawyer takes an interest in the girl’s plight as well, especially when they learn that she left the Azores on a super-yacht. Not only is Buck a yacht owner, but he is also on a crusade against drug trafficking, and Paulo and Liliana have clearly stumbled onto a criminal operation of some kind. The trail leads Aimee and Nick from Timbergate, to the Azores, to San Francisco. Paulo’s condition is deteriorating, and he might never be able to explain what got him shot. Can Aimee, her brother Harry, and Nick unravel the mystery in time to save Liliana? Sharon St. George’s writing credits include three plays, several years writing advertising copy, a book on NASA’s space food project, and feature stories too numerous to count. She holds dual degrees in English and Theatre Arts, and occasionally acts in, or directs, one of her local community theater productions. Sharon is a member of Sisters in Crime and Mystery Writers of America, and she serves as program director for Writers Forum, a nonprofit organization for writers in Northern California. Click here to find Sharon online. I strolled along the walkway leading to the main dock, hoping to look as if I belonged. When the couple ahead of me went through the security gate, I followed along behind them with a quick “Thanks,” as if they’d saved me the trouble of using my own passkey. When they went one way, I went the other. The harbor was large. It was going to take some time to walk all the docks, so I picked up my pace, passing the sailboats quickly and moving on toward the outer edges where the largest of the power cruisers were moored. Nothing I spotted fit Catia’s description, although some of the yachts were twice the size of Buck’s. I had stopped to admire one of them when I heard loud voices farther down the dock. Two men were shouting at each other in what sounded like a heated confrontation. They stood on a large power yacht moored at the far end of the dock. I stepped away from the main walkway onto the narrower finger of dock that separated two adjacent boats. From there, I could listen without being seen. The voices rose. I could tell they were male, but I couldn’t make out their words. A gusting wind had come up, causing the riggings of every sailboat in the harbor to jiggle and clank. I was about to step out from my hiding place when I felt the floating dock sway and caught the rhythmic beat of footsteps running in my direction. I edged farther back, away from the main dock. I heard a loud report like a gunshot and saw a running man suddenly trip on a coil of rope and fall hard on the dock, just across from where I stood. Lying flat on his stomach, he turned his head toward me and our eyes met briefly. He looked young and scared. Blood trickled from his forehead. I quickly hoisted myself up onto the nearest yacht, praying no one was on board. I dropped down and crouched in the cockpit, listening, straining to hear over the gusting wind and clanking riggings. I waited a few moments, but heard nothing more. I risked rising up slowly to take a look. The man lay still, eyes closed. No one else was around. As soon as I was sure it was safe, I would call 911 for medical help. I ducked back down and listened intently for another two minutes. With my phone at the ready, I rose again and peeked at the spot where the victim had fallen.